The Army officer who outed himself as a radical Marxist had been reported back in 2015 for publishing inappropriate and outright anti-American views online, according to a scathing report obtained by The Daily Caller. The report gave details on 2nd Lt. Spenser Rapone’s insubordination at the U.S. Military Academy and out-of-regulations online activity. Rapone graduated almost two years later in 2016. West Point’s Public Affairs office quickly released a statement last week condemning Rapone’s actions, saying that they “in no way reflect the values of the U.S. Military Academy or the U.S. Army… Second Lieutenant Rapone’s chain of command is aware of his actions and is looking into the matter.”The statement leaves readers with the idea that Rapone’s chain of command (and indeed the academy at large) was unaware of his radicalism and frequent Uniform Code of Military Justice violations. It turns out a senior officer reported Rapone to his chain of command nearly two years ago. In November 2015, after being removed from his Ranger battalion for violating standards, Rapone was a cadet in his final year at the academy. According to the report obtained by TheDC, after the latest in a series of incidents involving Rapone’s penchant for insubordination, Heffington became aware of Rapone’s radical leftist activity on social media and notified the cadet’s chain of command. The same day he wrote this report, Heffington contacted then-cadet Rapone’s training, advising, and counseling officer. The officer was disgusted, but not shocked, Heffington said. “Unfortunately, I’m not surprised,” the officer said, according to Heffington. This reaction is merely one of many indications that Rapone’s activism, radical views and immature opposition to authority were well known around the academy — and especially obvious to his chain of command. According to a former head of the Military History and International History divisions at the U.S. Military Academy, Rapone’s plebe year history professor also reported him to the chain of command. Heffington notes in his report that he told Rapone he did not understand what “putting someone on blast” meant, a rare comedic moment in an otherwise infuriating account. Rapone’s response, that he felt “singled out,” is puzzling when one considers the lengths to which the cadet went in order to cast himself as a righteous nonconformist. In fact, Rapone had singled himself out during his confrontation with Heffington, being in civilian clothes in an academic building (a violation of regulations), by refusing to stand when a superior officer entered the room (a breach of military protocol), and by refusing to answer a superior officer’s direct question regarding who had been yelling (refusal to obey a lawful order). Most incredibly, Rapone had the gall to respond with righteous indignation. “He seemed to look at me with nothing but contempt and hatred, no matter what I said or how I tried to reason with him to show him how wrong he was,” Heffington said in his 2015 report. Multiple other sources contend that Rapone willfully put his anti-capitalist, anti-military and anti-American views on display for the world to see, both in person and over social media. Two recent academy graduates, when reached for comment, suggested that Rapone’s reputation at the academy preceded him. Although they did not personally know Rapone, they stated that they were aware of his radical leftist views and his rebellious reputation long before his activism hit the news this September. This 2015 report unambiguously states that Rapone’s vehement anti-American views and his obsessive insubordination made him a dangerous liability to this nation’s military. Its author urged his chain of command not to allow then-cadet Rapone to commission as an officer. And, according to Heffington, every officer he spoke to agreed with this conclusion. In essence, everything that was reported over the previous week should have been old news to anyone in Rapone’s chain of command, had they been paying attention. National defense analyst and West Point grad Bob Maginnis shared Schlichter’s concerns. West Point Command/Leadership is the problem. 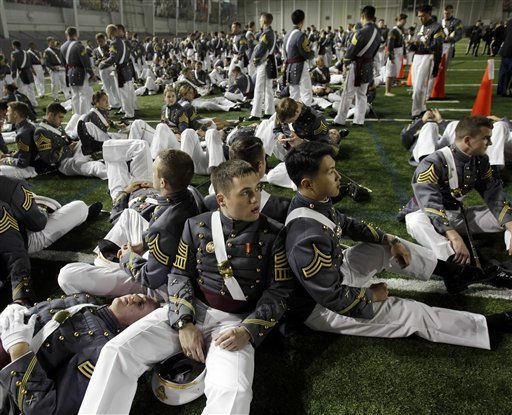 Obviously, this cadet should have been kicked out, so why wasn’t he? How many more marxist/islamists have graduated? The entire command structure needs to face Court Martial.